Any gem lover who has to list some of the most precious and truly beautiful gemstones of all times will always include the stunning Ruby gemstone on that list. Just like diamonds, emeralds, and sapphires, rubies have a high popularity all across the world. The royalty and the charm that they possess make them one of their kinds. The ruby stone has been a pride possession of royal houses globally, and that has been the case for many, many centuries now. Ruby is a powerful stone that is believed to activate passion and bring a sense of adventure and confidence amongst the wearers. It gives the strength and bravery needed to face the fears without hesitance. It is one of the best things ever happened to the mankind – thanks to the amazing benefits that it provides to the wearers. 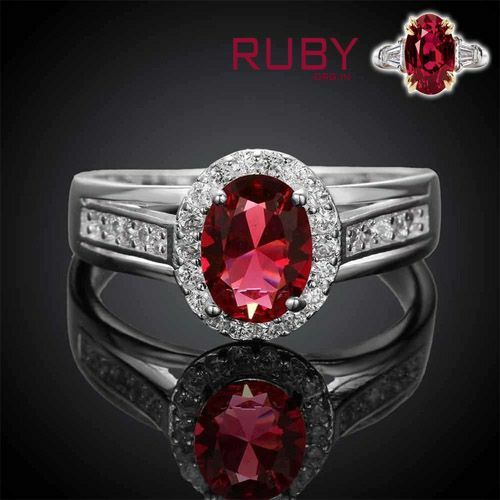 The word ‘Ruby’ is derived from the Latin term “Rubinius” which means “red”. The presence of chromium in the stone gives it that gorgeous red color. As the name suggests, the color red of this gemstone can be accredited to its mass appeal. 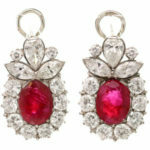 Rubies that are highly valued are available in a pure, rich and deep tone of red called “pigeon’s blood”. The color varies as per the location of its mining. From an orangish-red to a deep wine red, there is a wide range of hues that reflect their beauty on this gem. 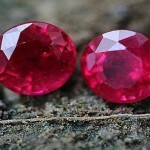 The beautiful, red-colored ruby stone is often known as “Ruby king of gemstones”. Apart from infusing passion, love, and courage, this stone is also said to bring peace and success to the wearer. 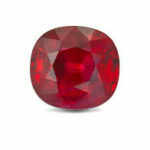 Zodiac compatibility – An ideal stone for zodiac signs like Aries, Cancer, Leo, Sagittarius, and Scorpio, the ruby gemstone promotes love, health, knowledge, and affluence. Effect on the heart chakra – It is believed that this stone stimulates the heart chakra and brings spiritual wisdom, protecting the wearer from negative energies. A generous stone that boosts creativity and protects – It is also said to increase vigor as well as the levels of concentration. By wearing ruby gemstone, the wearer blessed with fosters creativity and loyalty and ruby stone protects the family and possessions of the wearer. Useful in decision making – Another important property of this stone is that it provides clarity, helping the wearers to take focused and well-thought decisions. Ruby heals the mind by controlling anger and bringing positivity which is helpful to nurture a good mental health. It heals by giving the courage to take up new initiatives and to foray into the unknown with clarity and self-assurance. When it comes to healing the body, the ruby stone does it by curing blood disorders and circulation issues. It also improves detoxifies the body. Ancient records of ruby stone benefits in astrology and properties also list that it prevents starvation and has been helpful in protecting the wearers from the plague. While it also heals fevers and infections, a ruby gem is particularly useful to treat kidneys and spleen related medical conditions as well. Spiritually, Ruby heals by balancing the base chakra. By healing one holistically, this gem helps the person to take control of the present and go towards their dreams and aspirations with a reinforced self. For those who find themselves in the vicious circle of chronic lethargy and fatigue, this gemstone can prove to be a boon as ruby brings energy and stamina. Can Ruby Gemstone Be Worn By Leo Ascendant?